Don't ask me why, but laundromats fascinate me! Not that I ever use any (like a lot of French people I have a washer in my kitchen - yes kitchen! ), but probably because they look a bit depressing. When I saw this one a few weeks ago (I'm still sick so I did not go out yesterday), I immediately thought it would make a good photo (mainly because of the lonely guy in it of course, but not only). Have good Friday everyone, I'll finally go out again today so expect more fresh material soon!! Great picure Eric - as always - but where else would you have your washing machine? Unless you have a seriously large house with a buanderie/utility room. Those of us who do not have one usually refer to them as a "futility room". This laundromat looks lovely. Bright and clean. When one travels for long periods, one becomes acquainted with laundromats. And they never work in quite the same way in any one place. Some you have to buy tokens. Or the soap goes in a different place. In France, the ones I frequented never had a place to sit. I think you were meant to start, go and do something else, and come back. Several times people who didn't speak French or English helped me out, showed me what to do, traded precious change. That's part of traveling I love. And I don't mean the doing-the-laundry part. 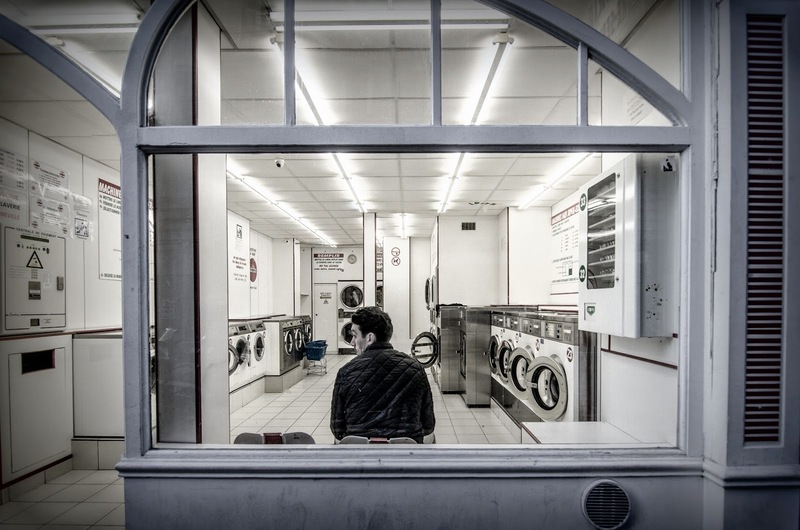 Only you, and Paris, could make a laundromat look so interesting. Comment on dit "laundromat" en francais? My friends and I need to know how to find one in a small French city. I want to email the tourist office to ask if there is a laundromat but I don't know the word. I think you could use the words : 'Laverie automatique'. Une laverie est un lieu où se trouvent plusieurs machines à laver le linge. It looks like a bright one. I have to frequent a laundromat once a week, but at least it gives you a place to sit and read. I love this kind of photos because they brought many pictures in themselves. I used to go to laundromat when I was living in my first one room apt. Somewhere odd and useful. During my brief stay in Paris 40(!) years ago, I found a Laundromat near my left bank hotel. I went in one evening with my jeans and flannel nightgown. When I put money in the soap machine, I discovered that the soap was not in a container, but loose and it fell to the floor. I put in another coin and held my hand under it to catch as much of the soup as I could. I also discovered that there was no hot water. When the laundry was finished, I took it out to put it in the dryer. Alors! It was closing time and the proprietor shooed me out the door with my wet clothes. As there was no heat allowed in Paris before October (it was late September and cold and rainy), I left the city of my dreams with damp clothes. It looks like Laundromats have improved quite a bit in the intervening years. However, they have all but disappeared in San Francisco. I have a laundry room in my apt. building, thank goodness. But I envy those who have their own washer/dryers. An homage to Edward Hopper ? A great shot. Hope you're recovering ! I love this photo! It captures loneliness perfectly. It's interesting that you can feel lonely in a crowded room, too. I sure hope you start feeling better soon! I have fond memories of doing laundry with my daughter in Paris in 2000. We had such fun talking to the other patrons and they were very gracious in helping us with our ghastly french. I love this photo, Eric. It's one of those photos that make you want to write a story about the fellow in the chair. I agree with Stuart, the image does have a Hooper-est quality. This is a fantastic photo. I'm fond of them, too. Saturdays were laundry days with my mom when I was a child. Odd that they would inspire good memories, but they do nonetheless. My first thought was "Edward Hopper" as well. For some reason, I've always found laundromats kind of depressing. Thank you so much for your nice compliments everyone. There are worst things in life than beeing compared to Hopper!